Sunnyvale, California-based deep learning cybersecurity company Blue Hexagon has announced it has raised $31 million in funding after emerging from stealth mode. This round of funding was provided by Benchmark and Altimeter. Blue Hexagon’s deep learning platform is able to detect known and unknown network threats with speed, efficacy, and coverage that sets new standards for cyber defense. For example, Blue Hexagon’s platform demonstrated nearly 100% detection rates against daily malware samples such as zero-day malware variants. Machine learning and security experts Nayeem Islam (CEO) and Saumitra Das (CTO) are the founders of Blue Hexagon. Islam used to be the head of Qualcomm R&D and Das is a former engineering leader at Qualcomm. Das was granted 330 patents and 453 patent pending applications in multiple areas such as machine learning, navigation, security, networking, and distributed systems. Blue Hexagon also has a staff of talent who used to work for companies like FireEye, Palo Alto Networks, Symantec, and Amazon. Blue Hexagon built its training infrastructure in collaboration with Amazon Web Services (AWS). “The transformative power of deep learning is being applied to a range of important challenges from autonomous driving cars and image recognition to cancer imaging. It has the potential to transform cybersecurity as well. We’re delighted to be providing Blue Hexagon with the cloud infrastructure they need to bring this vision to reality,” added Mark Ryland, the director of the office of the CISO at Amazon Web Services. Blue Hexagon’s threat detection technology is able to stop threats in less than a second, which can translate to savings in the millions from preventions of breaches. And Blue Hexagon consistently delivers over 99.5% detection rates and very low false positives in efficacy tests performed with daily threat samples — which reduces the need for SOC team investigation costs. “The state of the art for network security until now has been sandboxes and signatures. There hasn’t been a new approach to tackle the hundreds of thousands of malware variants that are created every day. Blue Hexagon changes the paradigm; their technology is a big leap forward in the arms race against the bad guys,” explained Benchmark general partner Eric Vishria. And Blue Hexagon can be configured for near real-time prevention by orchestrating enforcement on endpoints, firewalls, and web proxies to block malicious traffic at the network or application. 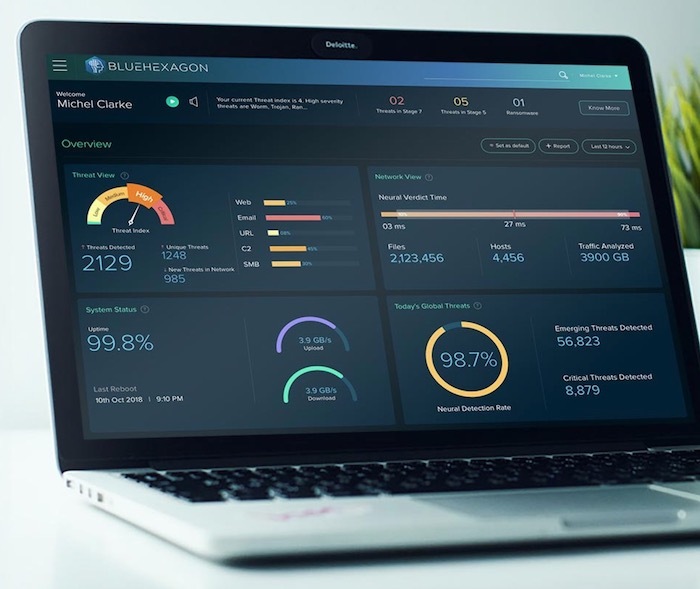 Blue Hexagon also offers a comprehensive management dashboard featuring automatic neural network classification into threats found, including threat family information and compromise indicators. “We invest in long-term partnerships with startups that have high growth potential. Blue Hexagon has the right team, technology, and vision to solve the massive cybersecurity challenges we’re facing today,” explained Altimeter Capital partner Kevin Wang. The company’s network security platform is priced and managed as a modern software-as-a-service (SaaS). And the platform works out of the box and requires no baselining or tuning. And it features a unique usage-based pricing model.